UPDATED New reports place the Fossil Palm OS Wristwatch preparing for a comeback next year. An updated version of the wristwatch PDA is planned to debut during the consumer electronics show in January. Fossil first licensed the Palm OS back in November 2002. 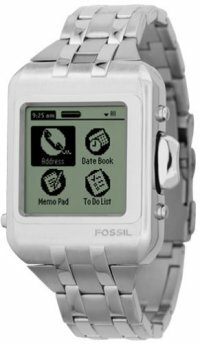 At the time, Fossil announced they would introduce the world's first Palm OS Powered watch called the WRIST PDA. It would include a grayscale touch screen and run a fully functional version Palm OS 4. It debuted at one of the last COMDEX shows the same year and was named best of show. After a long stint of delays and setbacks through 2003, the wristwatch was indefinitely postponed in September 2003. Fossil was adamant that the watch was delayed and not cancelled. The company claimed problems with "production quality" as the reason for postponement. A new report on i4u.com claims the Wrist PDA will be revised and relaunched during the Consumer Electronics Show (CES) in January 2005. Representatives from PalmSource have also stated that the licensee is expected to return in 2005. I4U has removed the article at the request of Fossil. Fossil states the information from the site was posted erroneously. This is a sweet idea. Let's just hope this one gets made. And by "updated" I hope they mean the OS. I don't think I would be interested in an OS4.1 device any more. Maybe I'm in the minority, but there are too many apps I use regularly that require POS 5.0. I really hope that you're kidding. Using this wrist PDA for anything other than the built-in function is probably going to be interface suicide. I downloaded the developer kit for this watch way back when it was first making the rounds. It was fun to play with the apps and see what changes they made. They did a lot of work to get the screen font / buttons large enough to work with such a small screen. For PDA stuff, this may actually be pretty cool. Just don't expect to play Warefare inc on it! Next question. Will the updated version be colour? I'd have to agree with eston. I don't see this as a product for the vast majority of folks who've been using a PDA for a while, but more for folks new to the PDA world. The thought of just putting on my watch in the morning and not having to carry the PDA in my pocket as well is appealing, but definitely not enough for me to switch. All in all, probably a small niche market that wanted a compact, electronic "day-timer" and likes wearing a watch. I could see this working, but they have to do a little innovation on the design side. That "BeemUpScotty" reject in the pic has gotta go. This could be useful and chic if done well. #1 Maximize screen real estate. No wasted space around the edges. Even a rectangular screen like some watches have now could work. OLED ooohhhh? #2 Reflective tech with at least 12bit color would be a must. Reflective is very fuel efficient, but still allows lighting when needed. Physically a little thick tho. #3 Hire somebody in Rome or Paris to make it utterly attractive. If it looks like the pic, only geekmeisters would dare strap this on. #4 Put IR on it and plenty of memory. 8-16mb of TT5 type flash? #5 Can the battery be integrated into the band somehow? Keeping it as thin as possible adds to the style big time. Also a comfortable watch helps when balanced. A thicker band with 8-12 battery modules could free up the bezel for killer electronics without great bulk. #6 Make a "screen saver" that shows a nice analog watch or switches between that and a photo slideshow or or or ... this could attract some real geekdom at the jeweler as well as some traction among the Neiman Marcus (sp?) crowd. #7 Gotta have OS5 to at least be in the century. Afterall, it's hardly more of a resource hog with a TI 126. Probably could underclock from factory at 75mhz. #8 What if it had "one-way GPRS or CDMA etc"?!? Use your cell phone or landline to update web clipping prefs at your carrier and then allow them to be "received only" by your watch. News, weather, sports, stocks etc could be flashed to the device on a schedule. Even GMT could be synced each time! I see problems having OS 5 in it. It has to run a hungrier ARM processor, so everything must be sized up (batteries). OS4 is a better option. Pat, that thing you're talking about is going to be three times the size of the concept. >> Just don't expect to play Warefare inc on it! Actually - and many don't realize this as the focus and screenshots shown are usually of the prettier OS 5, hi-res variety - but warfare runs on Palm OS versions as far back as 3.5. It is actually one of the more amazing aspects of this game IMO. I tried it on a m515 and an old Vx (greyscale, 160 x 160). You have to install a different version - but it works quite smoothly. Impressive. It is still a wonderful product idea, but for those who already own a Palm I'm curious how one would use it in practical terms _in conjuntion_ with another [primary] Palm device. I am refering to the sharing of calendar and address data (for starters) between the primary Palm and the watch. A product called RecoX, can sync calendar and address data between two Palms, but I would require tighter integration than RecoX offers...such as a desktop computer utility. Anyone have an alternative to the manual and tedious cross-synchronization effort that would be necessary? I still call these "birth control devices." When a date sees you wearing this, you will never get laid. So then it would appear you must have been wearing one all your life. How sad. Go to Vegas, Bubba. Even you might have a chance there. But bring money. A LOT of money. * My wife is 19 years younger than me -- she needed a real man and not the whimps her age that couldn't take her on. * She can drink most of the whimps on this list under the table and beat the **** out of them. * I haven't worked for someone else since I was 23 years of age. * Two magazine covers, a half dozen TV spots and a bunch of newspaper articles about me so far and counting. * Last time my wife and I were in Vegas we came back with a new car I won in a poker tournament. * I have a lot more money than you think -- and I got that way telling Microsoft and other market leaders to shove off. * While I have been called "The Baron" here. Those of you who play it too reasonable are still slogging in your cubicals. * I don't work in a cubical. * My commute is a twenty block run two work ... keeps me fit. * ... and I'll keep on at it 'til I die trying. If you wrote an autobiography of your life, would anyone want to read it? Why I love Palminfocenter - Prize for post #100,000??????? So since you're 33, that would make her... Oh dear - I assume you live somewhere in the Ozarks, Bubba. And you're proud of this because...???? The moonshine "business" must be doing well these days. Appearances in Hillbilly Weekly, Cops, and the local paper's Top Ten Most Wanted list aren't something most people would brag about. Why don't you tell us how your wife really made the money to pay for your shiny new Pimpmobile™? Wow. What are you, like 12 years old? No, really. No need to work when you gots yo' biotches on da streets, right, Pimpy? From Cell Block 5 to the prison courtyard? Please try harder. Harder. HARDER! HARDER! * And I don't change my account name every few months to keep on Trolling like you are. Get a ****** life. You don't get it, you never will. Have fun paying off your row house for the next 20 years. Yup, Bubba. I gots me a 14 year old wife! Sounds like you're really a "whimp" that's been working in a "cubical" too long. At least you get to go home and drink moonshine, play poker and brawl with your toothless 14 year old "wife". Congratulations. No doubt you two make a sweet couple. I would call you a dumba$$, but that would be an insult to honest, hardworking dumba$$es around the world. Are you from Arkansas, Tennessee or Oklahoma? Bad boys, bad boys. Whatcha gonna do when they come for you? I'm holding out for the Palm OS Wrist Watch Smartphone (with camera). Translation of the Press Announcement: we finally found a contract manufacturer that will not screw us over, is comming in cheap enough and will not screw us by delaying shipments Stateside. While channel surfing last night I went by one of the home shopping network (how many are there now? --- geez) that had the Microsoft versionof this deal made by Fossil, marketed by Abacus for sale for $50. It now comes with basic service for free. Is this a market that really needs new products? Most people that this will appeal to have either a PDA or a cellphone with them permanently. Well, I have the ABACUS watch *and* my Zire72. The watch is much more of a novalty than the Palm, but it's still fun to see updated news/stocks/sports scores throughout the day on the watch. Now the resurfacing of this disaster!!! We are definately trending back in time to the stone age! Yeah, my old Palm V was a useless piece of crap with 2mb of ram and that slim form factor that could go anywhere. We all know that once something better comes out, everything before it instantly stops working properly and can't be used for anything but a paperweight. What's worse is all those new Palm OS users that will buy this thing thinking it's "high tech" only to find out that it can't play streaming video off the internet in real time. What a waste of metal and plastic. Why would anyone even look at something that can hold addresses, remind them of appointments, keep notes and todos, and load any number of thousands of other nifty applications to do things that they'd like to have with them at all times on something as convenient as a watch, unless it can also play music, view true-to-life quality color images, and brew up some espresso? Or maybe, just maybe, it's a PIM with a really convenient form factor. Nah, that'd be crazy talk. If the purpose of this is to reach folks who need only the simplest of PDA needs, they are off the mark. Those folks are clearly not Techie people (otherwise they would already have adopted a PDA and would likely have greater needs). The likelihood that a non-techie person would walk around with this thing on his wrist is *extremely* unlikely. And no, it wasn't sexist to say "his wrist"; there is *no way* a woman would wear this thing. Well, not that image above, but the new version... saw one briefly a few weeks back. Much better stylus design than old one, and the performance was pretty good - certainly as good as any OS 4.1 device that's been launched before. The big fonts make it pretty usable...! I'd buy one!